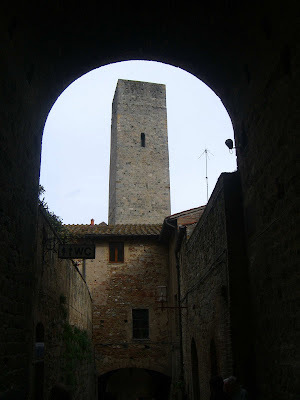 … with its towers that appeared like skyscrapers over the horizon. 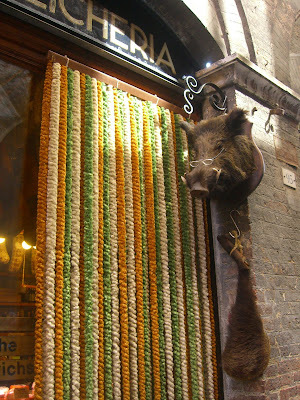 We also paid a visit to Siena where we drooled at shop-window displays of panforte before enjoying a satisfying lunch. 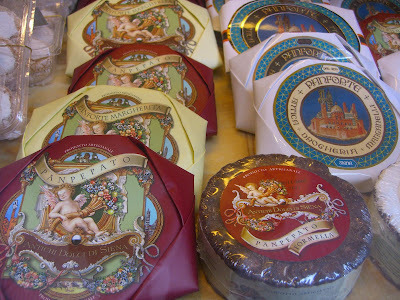 Panforte, a spicy fruitcake, originated in Siena. 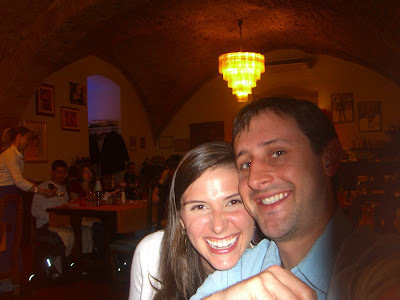 We left blue skies and sunshine and ducked into Al Marsili, a cavernous restaurant located in a palazzo cellar. 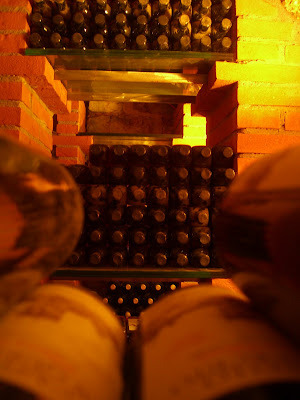 The restaurant claims that the wine cellar dates back to the Etruscan period. 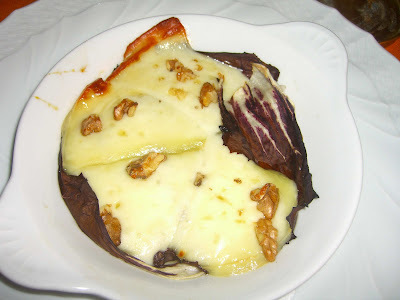 To start, we ordered a warm pecorino toscano with honey and walnuts. The pecorino toscano was softer than the more common Roman pecorino and melted easily. It reminded me of a sharp provolone. We each opted for pasta dishes. My pici all cinghiale was certainly unique. 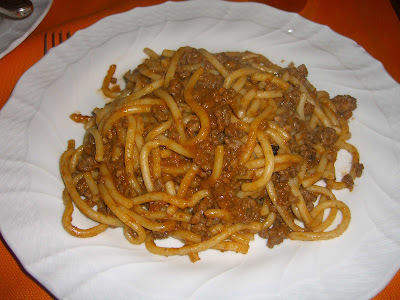 Pici is a thick, hand-rolled spaghetti that is typical to Siena and mine was made in-house. It stood up well to the wild boar ragu. 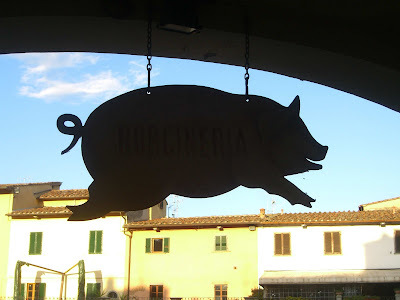 I came to think that Tuscans are obsessed with wild boar. Every few blocks is a shop with a stuffed boar head staring you down. 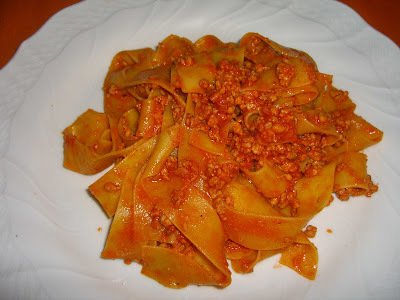 The pappardelle alla lepre was notable for its thick and flavorful hare sauce. 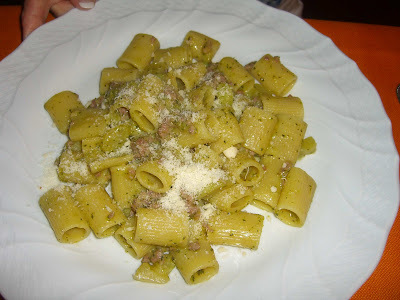 Laurie’s rigatoni with broccoli and sausage was on the lighter side. 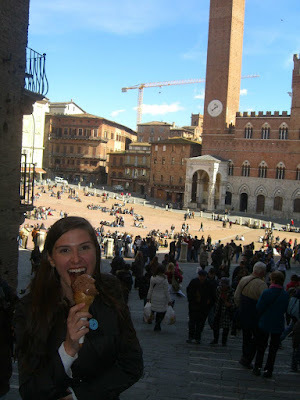 We admired the gothic architecture as we licked away at a chocolate gelato. 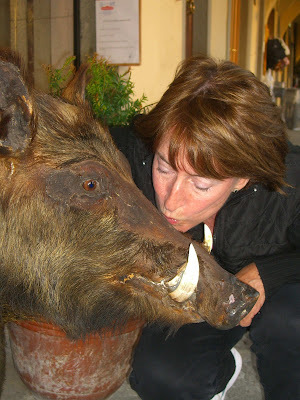 We discovered more wild boars in Greve in Chianti. Laurie got a little too friendly! 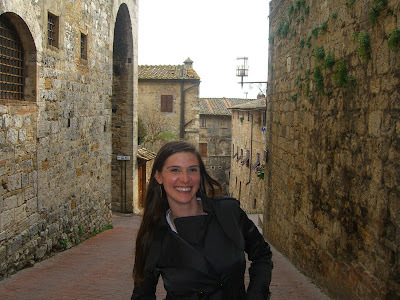 We also poked into some wineries between Florence and Siena to sample Chianti. 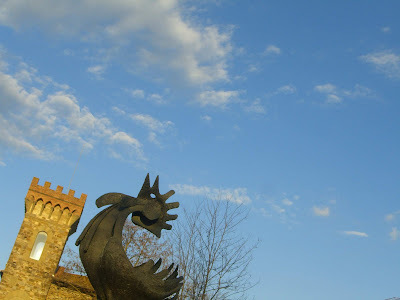 We learned that the gallo nero, or black rooster, on the neck of many bottles of Chianti Classico is a guarantee that the wine is locally produced according to strict rules. Once we were aware of the rooster symbol, we began to notice it everywhere. 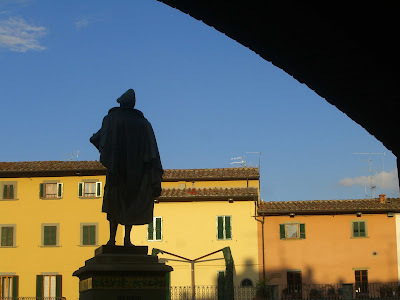 Brings back memories of our trip to and around Sienna last year. We put more than 600 Kilometers on our car. Beautiful country side! Yes it is just stunning, isn't it! We had perfect weather the whole time. Can't wait to go back. You look lovely in these pictures, especially stunning with the "wine bible"!